At the end of the 18th century, the province of Quebec was a colony of Great Britain, which also controlled a number of other regions in New England at the time. Britain’s dominant position across the continent lasted until 1775, the beginning of the American War of Independence. While the American revolutionaries were fighting for New England’s secession from Great Britain, they also tried to invade the province of Quebec. There were several conflicts between American revolutionaries and the British army, first in Montreal and then in Quebec City. When their military resources were exhausted, the British authorities had to hire German mercenaries to bolster their forces. Approximately 100 German mercenaries arrived in Quebec in the last decades of the 18th century for this purpose. Their arrival was an advantage for the British, who were then able to force back the American revolutionaries. The German mercenaries’ involvement contributed significantly to ensuring that Canada remained politically separate from the United States. Although the presence of the mercenaries was connected to the American Revolution, many of them stayed in Quebec longer-term and, with time, integrated into the Quebecois society. Some places in Quebec have memorials commemorating the historical legacy of the German mercenaries. 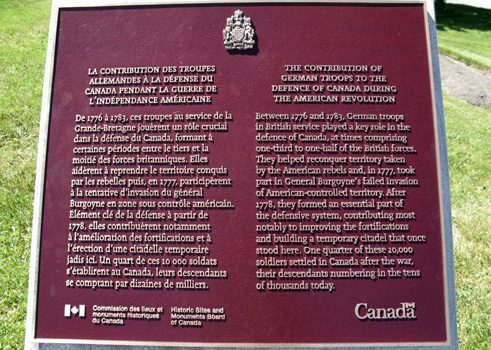 In 2009, the Canadian government erected a plaque on the Plains of Abraham, the site of the Battle of the Plains of Abraham, in order to officially commemorate the involvement of German mercenaries in defending Canada during the American Revolutionary War. This plaque was installed following a joint request from German institutions in the province of Quebec and the Société historique de Québec. 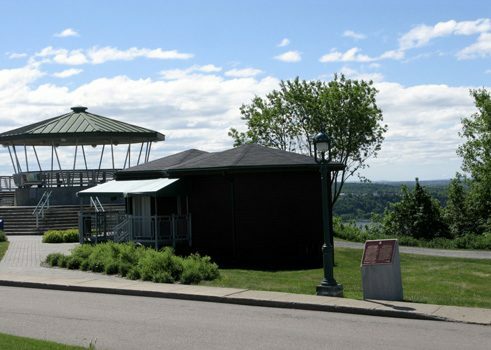 Today, the Plains of Abraham make up an important part of Quebec City, where the wide area associated with military operations is steeped in history. This church is located in the Saint-Jean Baptiste neighbourhood in the centre of Quebec City. 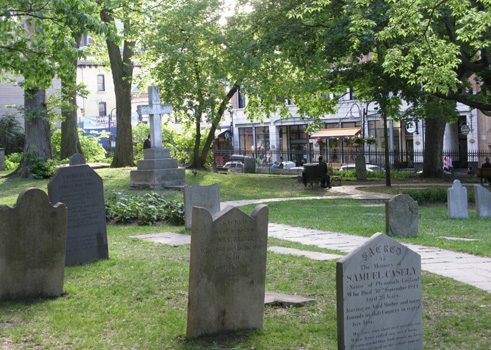 The walled parish estate is particularly noteworthy because it houses Quebec City’s first Protestant cemetery, which was opened in 1772. Since it was based in a majority-Catholic and -francophone city, the use of this cemetery was originally reserved for the Protestant minority and the local anglophone population. In time, German-speaking Protestants were also buried there, and included among them were some German mercenaries. Interested visitors can learn more about them from the cemetery’s gravestones. In addition to the mercenaries, Great Britain also recruited doctors from Germany who were responsible for caring for the military. Some of the German doctors decided to stay in Quebec, and many of them played an important role in local history. Among them was Frederick William Olivia, who was born in Germany in 1749 and died in Quebec in 1796. He had particular influence over the quarantines introduced to control epidemics brought over by European immigrants. Another high-profile figure in the city’s medical history was Anthony von Iffland. His parents were German doctors, and he was born in Quebec in 1798 and died there in 1876. His career was heavily shaped by the development of surgical technology and anatomy courses in Quebec City. These two doctors, like many others, have a connection to the historical site "Hôtel-Dieu de Québec", which was one of the city’s largest hospitals during their time.